Tonight we start broadcasting the 4th episode of Hybrid Theory! I've selected for you my favorite tracks of the last few weeks and some promos i've received on the release's way. Dont miss the begining of the episode because you'll discover 2 solid progressive tracks, definitly my favorites releases of the month. As usual i love to receive email from you so dont hesitate to send me your feedback, leave me a comment on this website / facebook / email. Yesterday was broadcasted the last episode of Tranceplorations, here is all the infos you might need to now, tracklist podcast etc. I'm glad to annouce that tomorrow we celebrate de 100th episode of the radioshow TranceverStrahl broadcasted on pulsradio trance chanel. Take a look at the timetable i'll have the honor to open this event @18:00. Dont forget In the mean time Hybrid Theory 003 is broadcasted on http://www.tranceradio.fm/. Get prepared for a new episode of "Hybrid Theory"! As usual i've prepared for you the greatest tune of the moment, in this episode lots of emmotionnal trance music and some banger you would'nt miss. I'm also glad to announce that the famous trance.fm radio is now broadcasting the show in addition to http://www.tranceradio.fm/ so welcome to the new listenners discovering Hybrid Theory i hope it'll be easier for everyone to catch a live brodcast. I love to receive email from you so dont hesitate to send me your feedback, tell me what you think about the show, ask me requests or feel free to send me promos. Here is the radios broadcasting the show, there is great stuff on it so check this out. Are you ready to be uplifted? Yea the second episode of Hybrid Theory is coming soon on your radio station, int this one only pure banging tunes so fasten your seatbelt and get prepared for a hard trance beat journey. 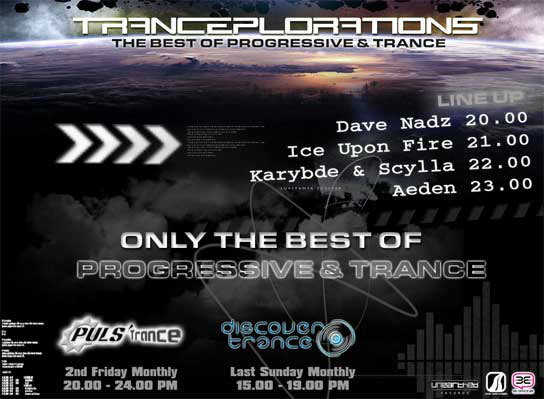 Here we are, a new year is beginning so as the new season of Tranceplorations your monthly trance rendez-vous. Tonight was brodacasted the 01/2013 episode and maybe you've not been able to tune in the live broadcast so here is a catch up session. It's been a while i was thinking having my very own radio show. Well ... http://www.tranceradio.fm/ is a brand new webradio that gave me few days ago the opportunity to start this new project. So i'm proud to announce that this monday the first episode of "Hybrid Theory" will be broadcast on tranceradio at 6PM till 7PM (CET). HT is a monday bi-weekly (once every two weeks) radio show so in addition to Tranceplorations you'll catch me more often on air. First of all i'd like to wish you a merry christmas. I hope you had a sweet day with your family and loved ones. 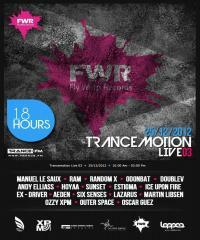 So Today i was invited by Fly Warp Records for the Trancemotion live 003 event broadcasted on http://www.trance.fm/ bringing on togheter Martin Libsen, Ozzy Xpm, Lazarus; Six Sense, Aeden, Estigma, RAM, Double V, Manuel Le Saux & more. I would have liked to tuned in live to share the tracklist live with you but i have not been able to be home in time. So if you've not been able to catch the live broadcast here is a catch up session. I hope you'll like it, dont hesitate to share the link, leave me a comment and tell me what you think about it ! Here we are, this is the last episode of the year. I'm glad to welcome you tonight with Dephasys Karybde & Scylla and Aeden. I take the opportunity to thank you for your amazing support and wish you all the best for 2013 ! This episode is gonna be awesome crossing universes from progressive to psycho trance music !